High Holidays 2018 | Congregation Anshi S'fard: Judaism. Community. Morningside. 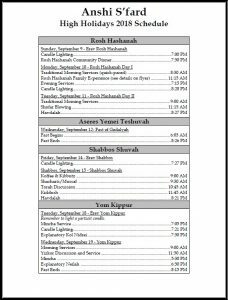 From traditional services, to yoga, and from a Rosh Hashanah Dinner, to a BBQ in the park, we have tons planned for the High Holiday season at Anshi! Click on the images to download a printable PDF flyer. Start the High Holiday season with a bang! 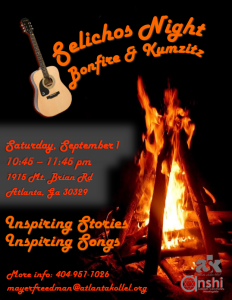 Saturday night, September 1st from 10:45-11:45pm, we will be getting into the High Holiday season spirit with music and storytelling around a bonfire at the home of Jean Alhadeff and Efrom Prater – 1915 Mt Brian Rd. Inspiring stories and inspiring songs. No RSVP needed and everyone is invited. Bring along an instrument! 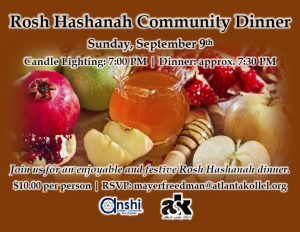 Bring the kids for some pre-Rosh Hashanah fun! We will having a petting zoo and bounce house from 10-11:30am. No cost to attend and no RSVP needed. You can find out more information about the Morningside Sunday Experience on their website. Join us for an enjoyable and uplifting community dinner as we welcome in the new year. Candle lighting will be at 7pm, with dinner beginning approximately 7:30pm. It is only $10 per person and is open to members and non-members alike. Please RSVP to info@anshisfard.org. In addition to Anshi’s traditional services, we are excited to once again be offering a family friendly program. 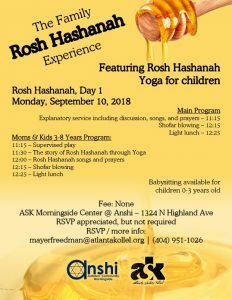 The Family Rosh Hashanah Experience features Rosh Hashanah yoga for moms and kids and an explanatory and engaging program for the adults. And as there is no good Jewish event without food involved, it ends with a light Rosh Hashanah meal. Members and non-members are welcome to join us for this program. There is no charge to attend and RSVP, though appreciated, is not required. (RSVP for the babysitting, however, is required.) To RSVP or for more information, please send an email to info@anshisfard.org. Click on the image below to download a printable PDF flyer. 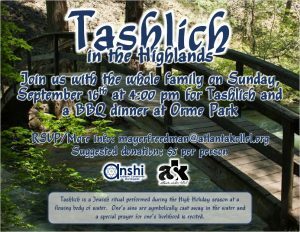 Join us at 4pm on Sunday, Septemeber 16th in Orme park for Tashlich and a BBQ dinner! RSVP appreciated but not required. $5 suggested donation. 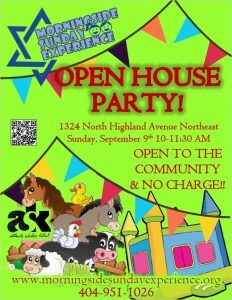 Not yer ready for a full Yom Kippur service or need something kid -friendly? 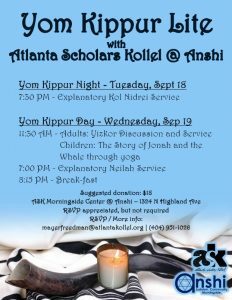 Join us for Yom Kippur Lite!